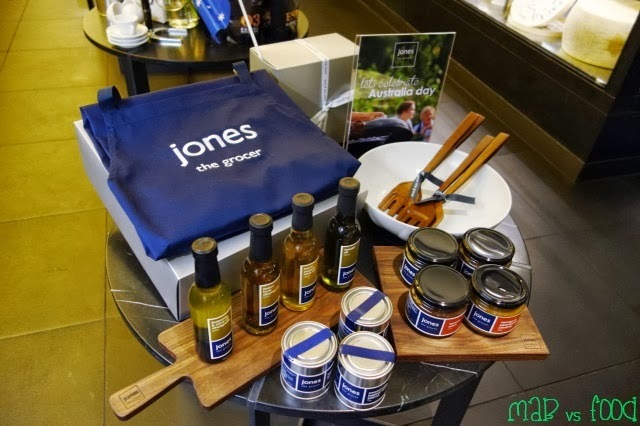 Jones the Grocer has moved their original store in Woollahra to the space vacated by Justin North's failed Becasse empire in the food court on level 5 of Westfield Pitt St Mall. 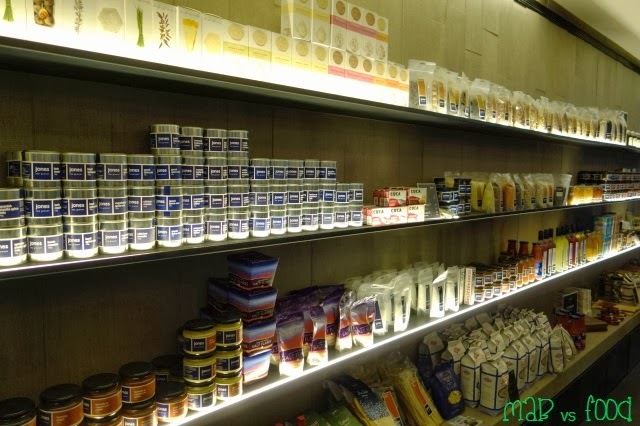 Jones the Grocer bought the Becasse group after it went into voluntary administration, which included Becasse Bakery, Charlie and Co Burgers (which have both been retained), and also the fine dining restaurants Quarter 21 and Becasse. 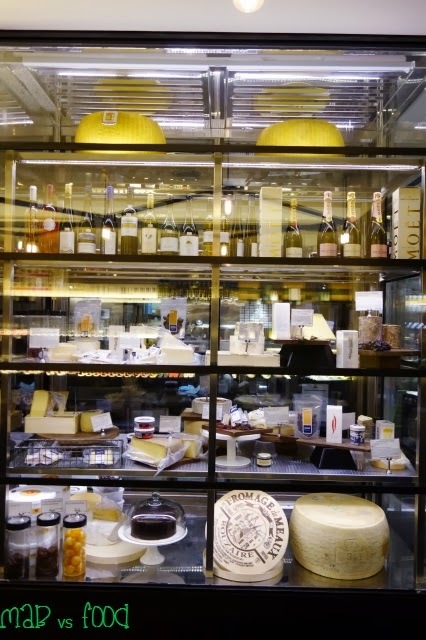 Louis Vuitton Moet Hennessey has a 50% stake in Jones the Grocer through L Capital, the private equity arm of LVMH. It helps to be backed by investors with deep pockets, which Louis Vuitton Moet Hennessey most certainly have! 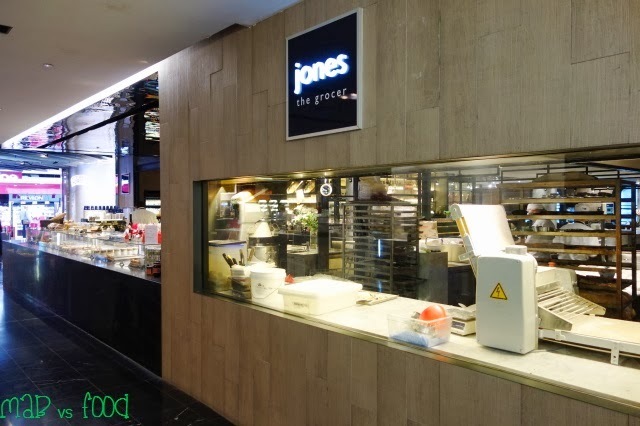 Jones the Grocer has relaunched the old Quarter 21 and Becasse into its flagship store that contains a bakery, patisserie, specialty coffee area and a retail offering that is similar with their stores in Singapore, Dubai, New Zealand, and Qatar, as well as a café serving breakfast, lunch and dinner. This sounds quite extravagant and is not something you see much of in the Sydney market. I was excited to see a fresh start but sad to see Justin North’s Becasse gone as Justin North has been one of my favourite chefs. I love the set up. Since my first trip to Japan, I have fallen in love with food halls on the basement levels of Japanese department stores. This reminded me a bit of that although on a much smaller scale! The space has a relaxed feel about it and the area was nice and spacious. 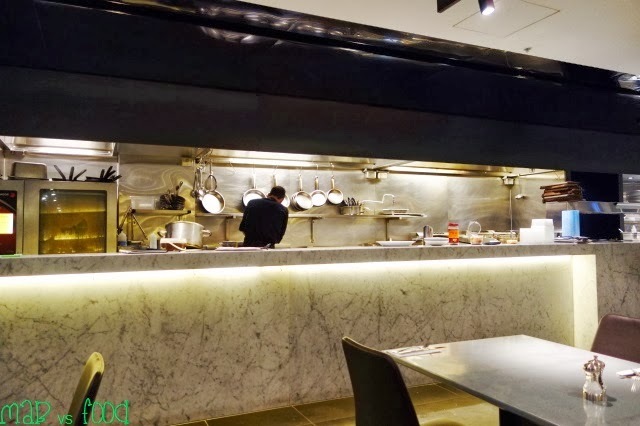 And did I say that I love open kitchens, because they have one! 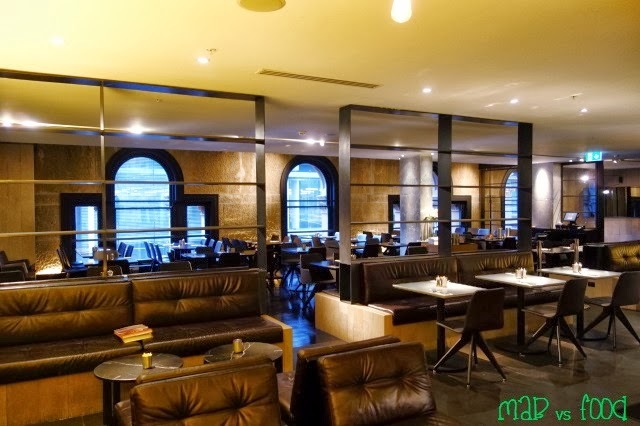 I was kindly invited to sample a 3 course meal at Jones the Grocer for 2 people by Cav Con. I brought my wife as the +1 (as always). So here's what we thought of the things that we got to try. To start off the meal, we sampled a couple of Jones' own cordials made with natural ingredients and preservative free. 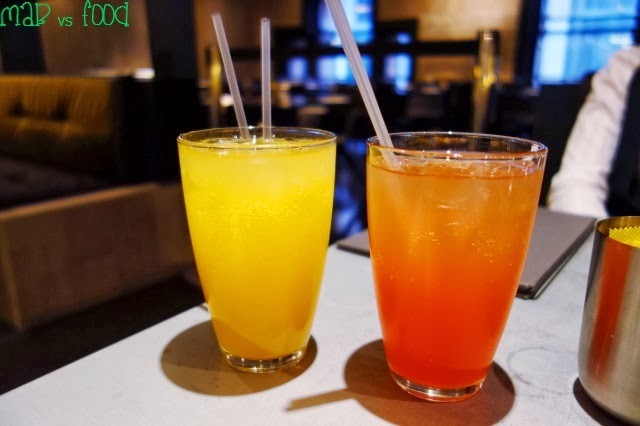 We tried the mango and the blood orange & cardamon flavours mixed with sparkling water. I enjoyed both of these as they actually taste like the actual fruits and not artificially flavoured. And who doesn't like fizzy drinks? My preferred cordial was the mango being the mango fanatic that I am. For entree I ordered the salt and pepper squid after our waitress recommended these to us. 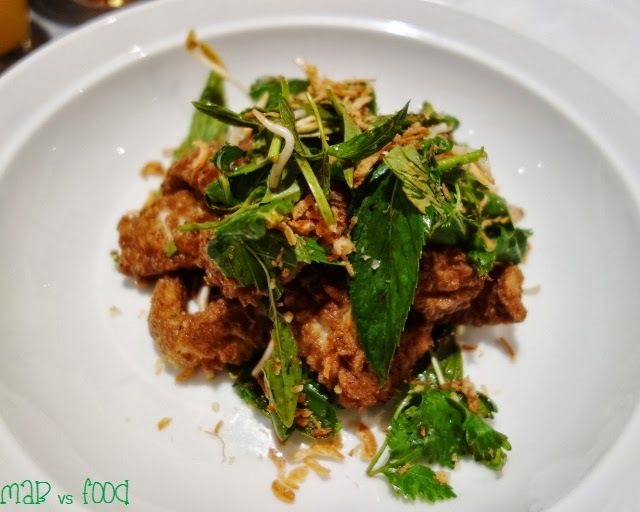 Not the crispiest salt and pepper squid that I have had, but enjoyable nonetheless. The squid was tender and not the least bit rubbery. I also enjoyed the Thai flavours in this dish. I adore yuzu but I couldn't really detect much yuzu flavour though in the mayo. For entree, my wife had the soft herb risotto. 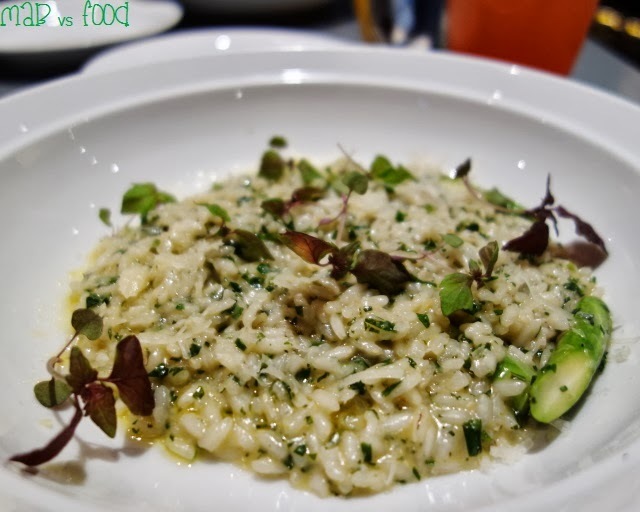 The risotto was cooked al dente and just enough so that the rice was not chalky. My wife liked how the risotto was creamy and cheesy without being too heavy and rich. The truffle oil adds a good wallop of flavour to the dish too. For the main, my wife had the linguini with forest mushrooms as there were no other choice. 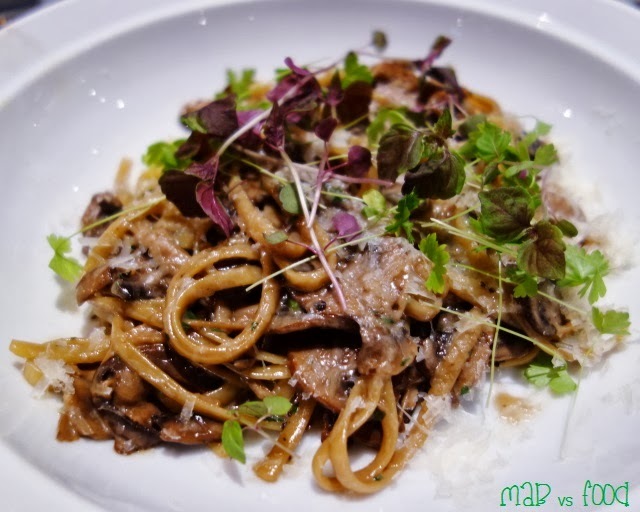 Mushroom, cheese and pasta is a classic combination that seems to always work so we enjoyed this one. 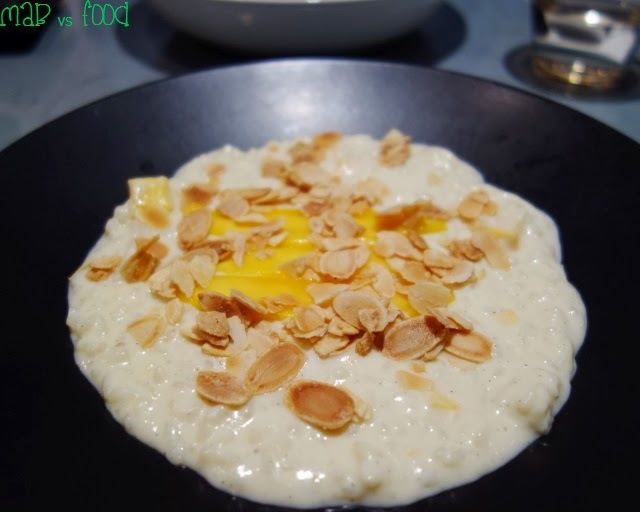 But we can't help but think that this is a bit too similar to the vegetarian risotto entree, especially with the same dose of truffle oil applied to both. We feel the vegetarian offerings at Jones could be improved with either more vegetarian options or offering 2 courses that are distinctively different (a non-carb based dish would be great, but unfortunately we don't see too many vegetarian courses around that aren't centred around a carb component). For the main, I had the slow cooked beef rib which comes with not one but 2 different types of beef! The serving is absolutely massive and can feed 2. The beef rib was not as mouth watering tender with meat falling off the bone as I would have hoped from a slow cooked meat. A knife was definitely needed to eat this one. 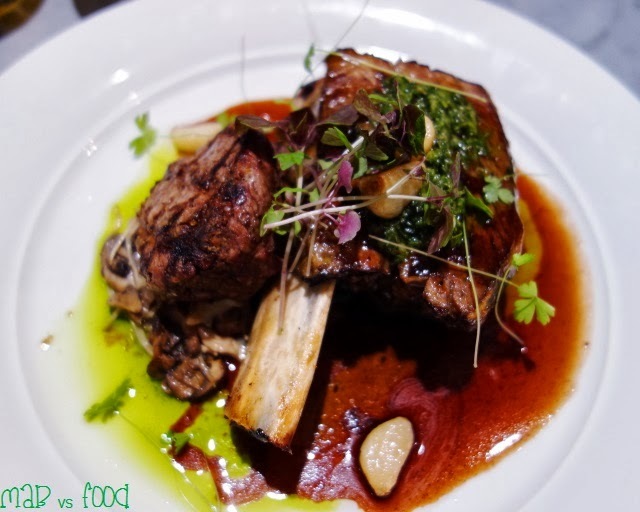 I did enjoy the flavours from chimichurri and mushroom & red wine sauce with the rib though. What I enjoyed the most about this course was the much smaller roast eye fillet, which was cooked medium rare as requested and had a beautiful pink centre. The meat was very tender, well seasoned and had great flavour. Saving the best for last! I find that the best items on the Jones menu are the desserts. Although I didn't try it on this occasion, the citrus panna cotta with strawberries, basil, and candied almonds is good and worth trying (click here for the thoughts on the panna cotta and other items on a previous visit). Our waitress insisted that we try the sticky date pudding and she was not wrong to do so. We both loved the sticky date pudding - absolutely delicious! 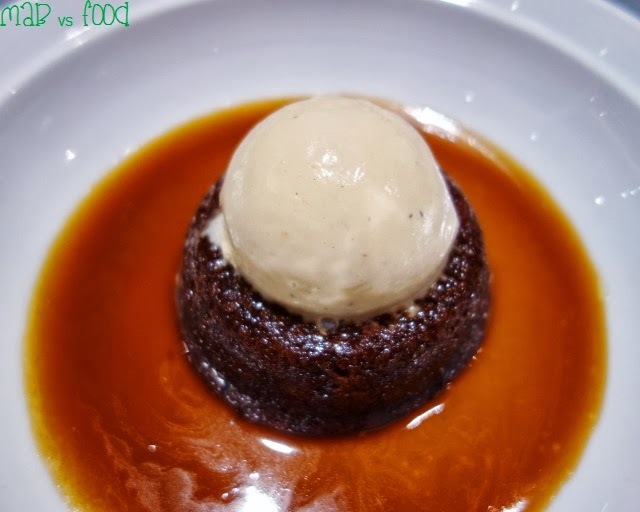 The pudding was warm and moist in the middle and so good with the salted caramel sauce. This was a sweet and rich dessert so goes perfectly with a scoop of vanilla bean ice cream! The other dessert that our waitress recommended was the young coconut rice pudding. This one is definitely more for the Asian palate as it is not too sweet or heavy. The rice still had a little bit of bite too so it was not a big pile of mush. This dish was reminiscent of the classic Thai mango sticky rice dessert. 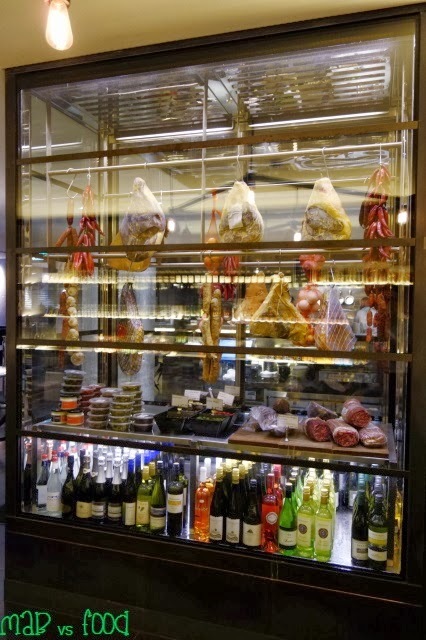 Jones the Grocer is a good place to go for a casual meal. There are lots of tasty options and I found the menu to be reasonably priced. I also found the service to be friendly and helpful when you need ideas on what to have. And Jones is conveniently open for breakfast, lunch and dinner too. I dined as a guest of Jones the Grocer. Thanks to Cav Con for arranging my visit.